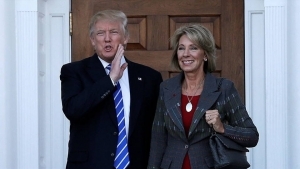 U.S. Education Secretary Betsy DeVos says Oklahoma teachers should return to their classrooms. According to a Washington Post report Monday, the nation’s top public school official is taking aim at teachers in Oklahoma, who are protesting paltry public education funding. Educators in several conservative states, including Oklahoma, are clamoring for better pay and better school funding, walking out of classrooms. But DeVos says the protests should not impact classrooms. Tens of thousands of Oklahoma teachers converged on the state Capitol last week, demanding more money for the state’s schools, which have endured some of the steepest spending cuts in the nation. While the protest began over teacher pay, educators have shifted their emphasis, pressing lawmakers to invest more in classrooms and saying their walkout is in the name of students who are not getting the resources they need to learn. Children in many districts — including the state’s two largest — have been out of the classroom for five days, and many schools are expected to remain closed this week as teachers continue their fight. Churches, community organizations and even the Oklahoma City Zoo have stepped up to provide childcare and to make sure children who rely on schools for meals get food. North Carolina education leaders say the state’s teachers have no walkout plans, although the N.C. Association of Educators is planning a May 16 advocacy day to time with lawmakers’ return to session. The News & Observer detailed North Carolina educators’ complaints in an opinion piece this weekend. North Carolina’s Republican lawmakers don’t mind pushing teachers around. They’ve refused to fully restore education cuts imposed during the Great Recession — almost a decade ago — stripped teachers of extra pay for advanced degrees, eliminated tenure protection for teachers hired since July 2013 and dismantled a pay scale that provided annual raises. Republican legislators also tried to bar the teachers’ lobbying group, the N.C. Association of Educators, from deducting dues from paychecks, but a court found that law unconstitutional because it unfairly targeted one group. North Carolina’s tough treatment of educators and education has been a template for other Republican-controlled states: Cut taxes and sharply limit spending on a top expense — public schools. But now teachers in other Republican-controlled states are taking direct action against that model. In West Virginia, Oklahoma, Kentucky, and possibly soon in Arizona, teachers have walked out to demand more pay and better overall funding for public schools. Mark Jewell, president of the N.C. Association of Educators, called the walkouts “red states rising against the cuts and dismantling of public schools. North Carolina teachers, lacking union protection and still hopeful that the legislature may come through with more money, are holding off on direct action, but they are cheering on the red-state rebellions. “I think it’s wonderful, powerful and amazing,” said Rahnesia Best, a fourth-grade teacher at Olive Chapel Elementary in Apex. North Carolina teachers are not walking out — not yet anyway — but they are preparing to march in when the General Assembly reconvenes on May 16. The NCAE plans a major “Day of Advocacy” rally at the Legislative Building to demand better teacher pay for themselves and increased school funding overall. 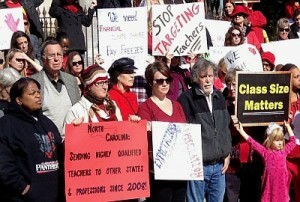 Ironically, North Carolina teachers won’t walk out over low pay because they need the money. A state-by-state analysis of teacher pay adjusted for inflation published by the online news site VOX found that North Carolina teacher pay has dropped by 5 percent since 2009. Since 2009, North Carolina teachers’ average salary rose from $46,850 to $49,837. But when adjusted for inflation, the average salary has dropped from $52,472 to $49,837. Meanwhile, hikes in insurance premiums have further eroded their pay. For school funding, it’s the same story. Before the recession, North Carolina ranked as high as 20th in per-pupil spending, according to a ranking compiled by Education Week. Now it ranks 40th. Bethea said she appreciates the modest pay increases of recent years, but it’s not all about salaries. Teachers take reduced pay, she said, in return for other benefits – such as tenure and health insurance after they retire – which are being taken away. State Rep. Craig Horn, a Union County Republican who leads the House committee that oversees education spending, acknowledges that teachers should be paid more, but he wants more funding tied to measures that will improve results in the classroom. Without more respect from lawmakers, North Carolina may soon be desperate to have any teachers. Period. Betsy DeVos needs to mind her own business instead of our Oklahoma teacher’s. She wasn’t in our state visiting when she started running her mouth. If Miss U.S. SecEd wants to put anybody on blast, she should start with Governor Fallin. Miss U.S.SecEd should be asking where all the missing money is in this state and until she decides to visit Oklahoma classrooms, she can keep her mouth shut about our teachers. They are the ones fighting for our kids. I am a grandmother raising a special needs child and I support these teachers and the walkout. If it takes a month I support them. Governor Fallin has done nothing but run from these demonstrators for the past week. Oh, maybe that’s because her term is up and somehow the state of Oklahoma is $167,000,000+ in the hole.These legislators with their snarky comments aren’t a much better example. They embarrass me. They are upset because they have to work. Governor Fallin made the comment that she “didn’t like the hostility in her building . The only hostility has been from her and her legislators. Miss U.S.SecEd you choked on a 60 Minutes interview. Obviously you are not quite the education expert you think you are. Keep your comments about the Oklahoma teacher’s walkout to yourself. OKLAHOMA TEACHER’S-YOU ROCK!!. Stand your ground. Thank you for fighting for my student.